Adrián Castañeda was born not far from the U.S. border as one of four children and was training as an engineer when he received word that his mother, then living in Arizona, was seriously ill.
He’s a gentle and thoughtful human being who exudes confidence and a resilient spirit. Adrián says he tried to go through legal channels to come to this country to visit his mother, but the request was denied. At the time, Adrián says, he believed his mother might be dying and this left him with a difficult choice — to cross illegally to visit his mother or to abide by the law and possibly miss saying goodbye to her. Adrián, who had a house, girlfriend and a career in Mexico, acknowledges he chose to break the law in entering this country. He got a ride in the hidden compartment of a relative’s vehicle across the border. I wonder what choice I would have made given the same circumstances. His mother eventually recovered, he said, and then he faced another choice — return to Mexico or stay in the U.S. His father’s boss offered him a job for $16 an hour — far greater than he makes as an engineer in Mexico — so he stayed in Arizona. Arizona in 2010 passed a controversial anti-immigrant law that allowed law enforcement officers to stop and demand papers if individuals were suspected of being undocumented. The law put undocumented individuals on high alert and he decided to come to Washington state where he heard it was easier to find work. He found his way to the Wenatchee Valley and eventually met a beautiful literacy tutor who shared his Christian values. However, she was from a conservative Republican family and was initially adamant that she couldn’t become involved with someone who was not in the country legally. Eventually, she came to understand his reasons for entering the country. When I was chatting with Adrián and Keisha in the presence of their pastor, Thom Nees, there was a telling moment when I asked him about what first attracted him to his wife. He smiled broadly and indicated it was beauty and she blushed. They ultimately married and have three kids under the age of 4, and they are cobbling together a life in a most uncertain situation and scant finances. He admits it has been a struggle to make ends meet. He struggles with the fact that she has accepted some public assistance for their children, who are citizens and eligible for social services. Finding a job without proper documents is very difficult. “My only option is to work in the orchards,” Adrián told me. His ability to pick fruit quickly made him a valuable asset in the valley’s agricultural industry. On his best days, he says he could pick seven to eight bins while others coming in on work visas could only pick two or three. Orchard work and moving around from job to job gives him an opportunity to continue working to support the family. The rhetoric of the recent presidential campaign has “freaked out” undocumented individuals in our valley, he said. As immigrants, “we came to be part of this society, not to take advantage of it,” Adrián said. The fear of deportation is so strong that those living under the radar screen tend to be conscientious about following the laws of this country. The Wenatchee Valley, he said, has been like a sanctuary city in many respects, compared to Arizona. Adrián knows something about biased attitudes. He acknowledged that as someone from northern Mexico, he has always felt biased against those from the southern part of the country. We all deal with our own biases. I was surprised to learn that he believes it would be a mistake for this country to provide amnesty to everyone who is in this country without documents. Once legal status is achieved, he said, workers will inevitably seek to better themselves and will leave the farms and orchards for traditional work, which would create a need for additional undocumented labor in this country. His rationale shows a depth of understanding and perspective so often missing from discussions in our political circles. These are complex and challenging issues. Adrián knows that he is at risk for being deported from this country, but if that happens he will accept those consequences. After all, he entered illegally and stayed and he accepts and understands the risks. “I came over the wrong way,” he says, but given the circumstances he says he would make the same decision today. Despite living in the shadows, he met and married the love of his life. Uncertainties are part of his experience. 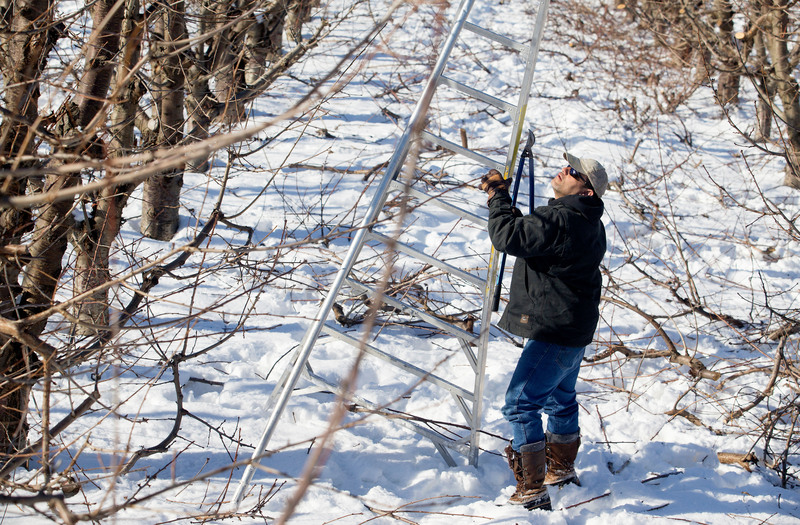 Adrián Castañeda works in an orchard pruning cherry trees on Feb. 2. He is an undocumented immigrant from Mexico. He says his goal while pruning is to make $150 a day. He and his wife have begun the legal process of seeking a waiver that would allow him to stay in this country legally because of economic hardship issues.